Westport is a small town that sits on a slim peninsula on the south side of the entrance to Grays Harbor from the Pacific Ocean. This popular vacation spot is an even better place for waterfront living or owning a second home, with some of the best razor-clamming opportunities around, fabulous seafood eateries, sandy beaches for strolls, outstanding surfing and fishing. 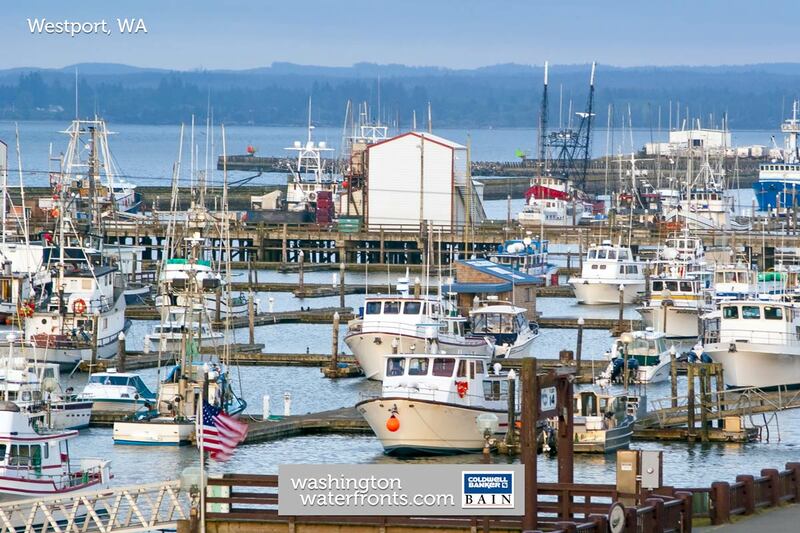 Westport waterfront real estate owners will also have access to the largest marina in the Pacific Northwest, which hosts moorage space for 650 commercial, charter and sport fishing vessels as well as a wide variety of pleasure craft. Westport waterfront real estate is especially ideal for seafood lovers as it doesn’t get fresher than purchasing straight from the fishermen at the marina. You’ll be able to pick up those incredibly tasty albacore tuna steaks to grill at home and dine on them while enjoying those unbeatable ocean views. Waterfront property owners in Westport have access to miles and miles of beaches as well as outstanding salmon fishing in the fall at the boat basin, where there are so many of the fish that you’ll marvel at the large numbers swimming around. Spring brings fishing for herring in such large schools that they often saturate the entire boat basin. Westport and the entire coast, from Ocean Shores to Moclips, is surprisingly unpopulated given the lure of the Pacific and the rugged beauty of the coastline. Westport waterfront real estate buyers will find that unlike most of California or Florida, where oceanfront homes run well into the millions, quality waterfront homes can easily be snapped up at a bargain price. Whether you’re looking for a second home or a year-round residence, among Westport waterfront properties you’ll find everything from well-maintained, budget-friendly condos where you can walk right out your patio door to the beach to luxury homes with ocean frontage, Jacuzzis and a wide range of upscale, elegant touches. Take advantage of our industry-leading tools to make your property search as easy as possible and be sure to register for a FREE account so that you can receive email alerts whenever new Westport waterfront real estate for sale hits the market. If you're seeking to sell your Westport waterfront property, contact our Waterfront Specialists directly for a comprehensive listing analysis and to learn more about the cutting-edge marketing strategies we'll use to sell your home quickly for top dollar!